While they are at war, we come together to create peace, hope, harmony and love, at the bottom of the Canyons. For me, the celebration of life, is more special than ever before. And, as a result, I have pulled all stops to create beauty. As I enter the deep canyon town of Urique, I count my blessings: you all, among them. A certain intensity to really live, came over me. Who knows where or what will be next year. And, I have become obsessed to leave something of sustainable significance behind, simply a message of hope, to create peace and continued sustainability for the Raramuri. This event is not about THE BEST. 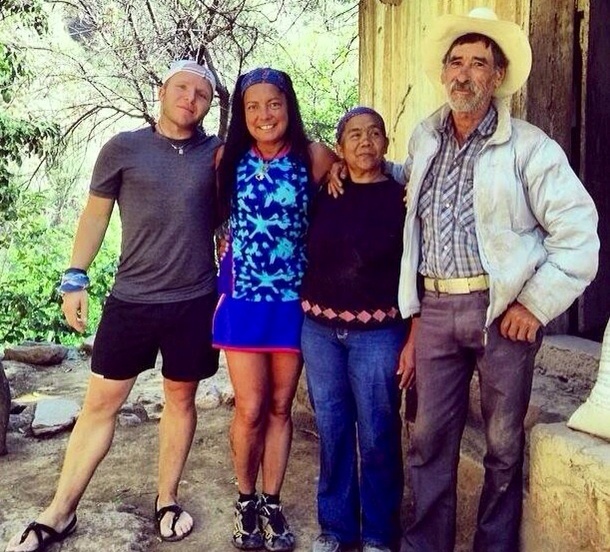 We want to encourage Raramuri to run, whether good runners or not. Thank you all so very much for attending this party. I really appreciate you: from Mas Locos, to aspiring to be, to aspiring to aspire. The world is changing. The basic concept of unconditional love, remains the same. Urique's local Artist, Yoyo, has graciously donated his time and talent to create a beautiful mural, honoring the free spirit of El Caballo Blanco, and our true respect for the running traditions of all Raramuri People. Greetings Mas Locos & Mas Loco Supporters! In 2002, in the Pueblo of Batopilas, Micah True, shared his vision quest with seven Raramuri, running free in a harmonious spirit of peace and love among the trails of La Sierra Madre. On March 2nd, 715 athletes representing 15 countries, including over 400 Raramuri, towed the line for the 13th annual celebration of running free among all cultures of running people. Inspired by the 2013 photograph captured by Mas Loco, and Photographer, Luis Escobar, taken of Raramuri families participating in the traditional Rarajipare ball race, the administration of El Presidente Daniel Silva Figueroa, commissioned local Artist, Yo Yo, to paint a mural on a building. This mural, invited everyone to celebrate the message of happiness and joy of running free. Presidente Silva's administration supports children's sports, education, family health, and honoring the running traditions of the Raramuri. The week's activities began on Wednesday, February 26, as Mas Locos hiked throughout the pueblos of Mesa Naranjo, Guadalupe Coronado, and Los Alisos, embracing the true spirit of Korima (a circle of sharing), sharing world wide gifts from the heart. Many families received hand crafted, woven bracelets, origami Caballo Blancos, personalized framed photographs of Raramuri families of Batopilas and Urique, frisbees, books, school supplies, toys and clothing. ranch of Los Alisos, the home of Prospero Torres, Micah's friend since 1995, and first race sponsor. Prospero and his wife, Sabina, believed in Micah's dreams of creating a foot race with the Raramuri. Whenever Caballo would travel between Batopilas and Urique, the ranch of Los Alisos, would be the gateway, crossing between two cultures of traditional Raramuri and Mestizos. Together, Prospero, Dona Tita Quintana, of Urique, and Micah, received an official notification of Govermnent support from La Presidencia of Urique for future Ultra Marathons. Upon entering Los Alisos, Sabina graciously offered to everyone bowls of steaming, chili seasoned beans, fresh patted tortillas, fresh mango juice, and grape fruits. 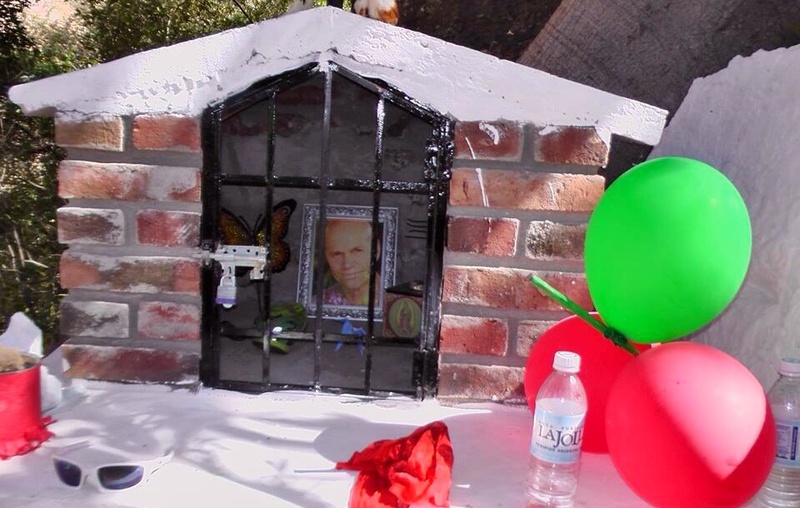 After dining, Prospero proudly displayed a permanent shrine he constructed with rocks, bricks and clay form the canyons, a permanent memorial to honor his friend, Caballo. He shared his deeply personal story of lasting friendship, reminding all in attendance, that the Raramuri, truly admired Caballo Blanco. And, that despite any outside influences of war, politics, even fame, their dream never died, and that the race, the message, the legend of Caballo Blanco, lives forever. Maria read a Raramuri poem, along with the poetry of Pablo Neruda. She encouraged everyone to seek the importance of their own journey, and to embrace a spirit of compassion for one another, with happiness and laughter. She placed inside the shrine personal gifts she and Micah had once shared. Maria and Josue invited all friends to take a private moment to reflect on the memory of Micah True. Several Mas Locos approached the shrine, leaving inside personal momentos. The Director of Tourism, Cecy, along with Urique's Sports Director, Arturo, and Mas Loco Flint Bourdeau, assisted immensely in coordinating all Volunteer assignments, ranging from packet pick up, kid's supplies, kid's race day celebration, aid station support. It was beautiful to see Raramuri, Mestizos, and Gringos, working harmoniously, side by side. At times, simply the language of smiles, genuine laughter, and friendship, needs no communication, or spoken words. Caballo's original race sponsor, Mama Tita and her staff at La Plaza Restaurante, was generous, and as busy as ever feeding thousands of runners, friends and families. She proudly displays a plaque of Micah True, at the entrance to her restaurant, above the bench which Micah often relaxed after a long run. She shares many stories throughout the years of her experience with Caballo Blanco, the Raramuri, and Mas Locos. Every race finisher, received a beautiful gift of Korima, from our friend, AKA Bill Molmen. Bill, is an accomplished ultra runner, and artist from Hawaii, who hand crafts customized race amulets. The amulet, is inspired by the spirit of : "Hau 'oli Nui Loa", meaning Happy, very big, Way too happy! As Race Directors, seeing every happy, athlete cross that magical finish line, was truly a moment of joy. On Thursday evening, Race Supporter, and friend, Keith Ramsey, Maria and Josue, hosted a family meal, serving a delicious dinner of assorted meats, and fresh, organic vegetables from the lush gardens of his ranch of Entre Amigos. After dinner, to the hundreds in attendance, Maria was excited to share with everyone, a pre-screening view of film footage from the upcoming movie documentary of Micah's life, " Run Free- The True Story of Caballo Blanco,"
The fiesta began on Saturday morning, with the second annual La Corrida De Los Caballitos, Kid's race. It was our biggest turn out yet! 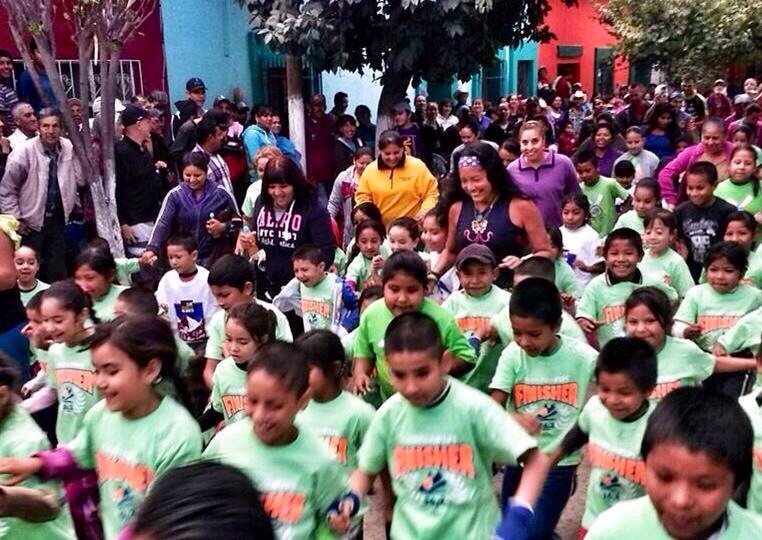 Over 500 children, running happy and free, throughout town, for a thrilling 4K. Every child was a winner, receiving a finisher's shirt, medal, a back pack filled with school supplies, and an individual dental kit. The overwhelming outreach of world wide donations, provided not only enough gifts to the children running the race, we were able to provide the additional gifts to students living in the remote areas of four surrounding, high country communities. Through the dedication and fundraising efforts of our friends worldwide, Norawas de Raramuri (Friends of the Running People), was able to provide over $25,000 in cash donations for the purchase of Vales (food vouchers) to feed the Raramuri athletes who participated in the race. Thank you, to our generous friends, who've sacrificed their time, and many miles, to make a difference in the lives of the Raramuri families of La Sierra. In the tradition of Korima, with respect and honor to the Raramuri, International finishers, Michael Versteeg, of Arizona, and Rickey Gates, of California, donated their cash prize winnings to the youngest and oldest Raramuri finisher. Although the founding Race Director, Micah True, is no longer with us, his presence, spirit and powerful Message, breathes ever stronger, and lives throughout the hearts of many. Through his vision, he created hope, giving a lasting purpose for the Raramuri, inspiring all of us to find joy once again in life, and to run free! We are truly honored to share this journey with you, truly a race in which everyone wins! May our voices sing as one. May we dance with a message of hope, peace, harmony, and love, resonating within our passionate hearts. 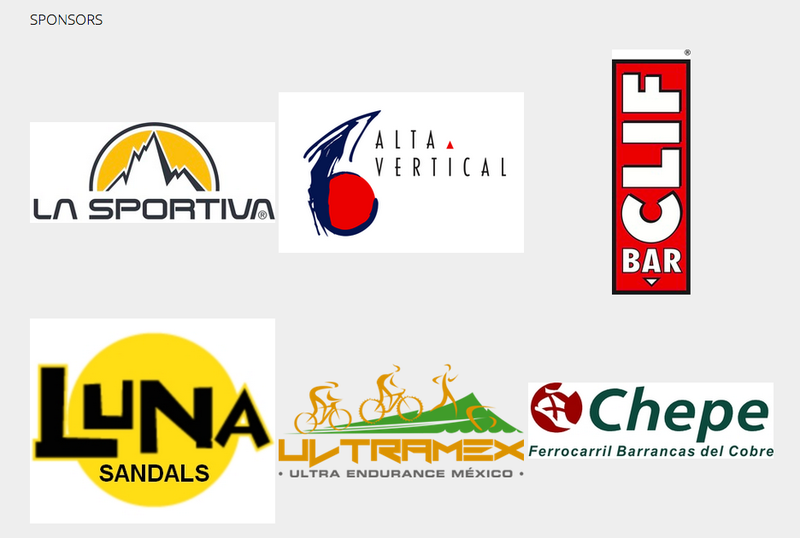 We would like to take this time to thank all of our Sponsors, Organizers and Supporters. Without you, none of this would be possible.